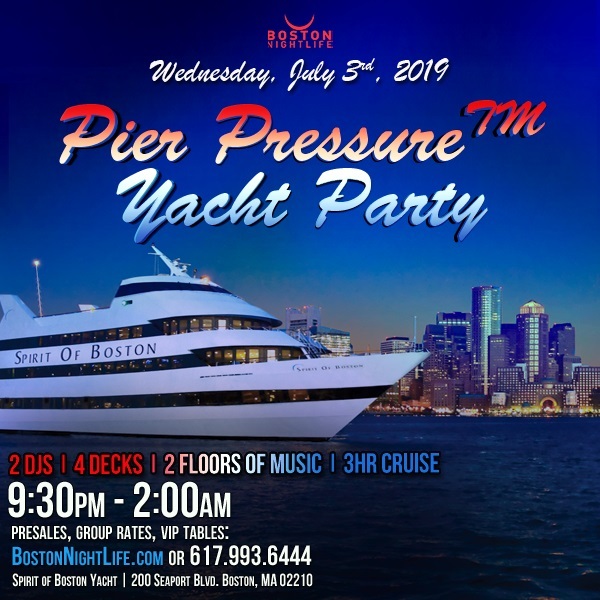 The only way to catch the true spirit of Boston is to embark on the Pier Pressure™ cruise. Let loose, and set sail along the gorgeous Boston Skyline aboard the mult-million dollar luxury yacht, the Spirit of Boston Yacht. Bring your significant other and/or your entourage of friends and create the ultimate experience that no club, hotel, or land entity could possibly offer. All Sales are final. Do NOT Miss the Boat, Gates close at 10:55 PM. Cruise leaves sharpley at 11:00 PM. Absolutely NO Refunds or exchanges. We reserved a spot for you on our cruise. Prices are subject to change while supplies last. NO REFUNDS OR EXCHANGES. ALL SALES ARE FINAL. Cancellation of your order is not permitted at any time after you place your order. There are NO REFUNDS, NO CANCELLATIONS, no credits, no exchanges, and no transfers after the order has been made. You must present the original credit card used to purchase the ticket, a valid Government Issued picture ID in order to obtain your ticket(s). At the time of your order, TicketVibe will place an order for your ticket(s) in the Events’ venue’s ticketing system, reducing the number of tickets available for the chosen event. If you encounter a problem at the event, you must file a complaint with TicketVibe within 5 business days following the date the event is scheduled to take place; failure to request a refund during such 5-day period will be a complete waiver of your right to request a refund. Our customer support email is info@vipnightlife.com.